Venture capitalist Marc Andreessen in 2011 wrote a popular essay on how “software is eating the world”. In my opinion, this is still true and it is no different in digital health. The only difference is that policies and government organizations have a strong influence in the type of solutions that get adopted first. Some of the largest digital health companies are ones that focus on electronic health records and delivering solutions to hospitals. At the company I work for our software was designed to fit the highest priorities of our hospital partners. 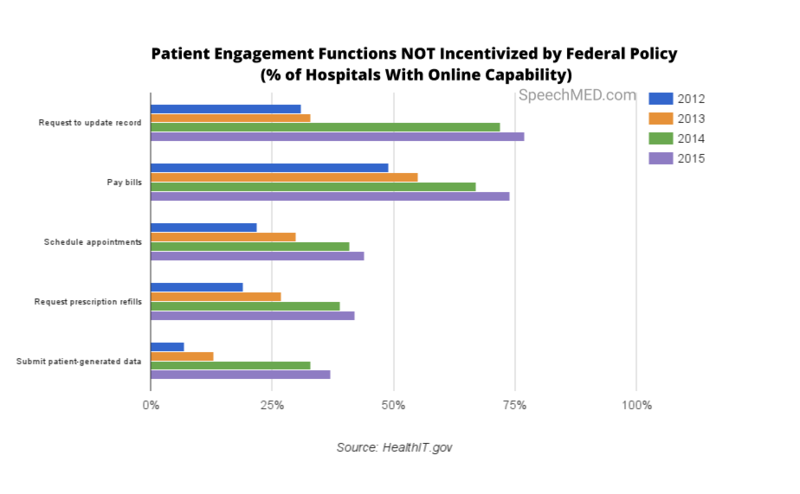 This led me to ask the question, “what patient engagement software functions are being prioritized in hospitals all across America?” Patient engagement software is the interface that helps patients and doctors manage medical information. These are the solutions that bring Slack like or Basecamp methods for care teams. Last week, we analyzed who was adopting this software. If we look at the top 3 functions being adopted by hospitals we can see viewing medical health information, downloading it, and being able to send that information. Viewing and downloading health information from a medical record in 2012 was between 14% to 24% in adoption. In 2015, both these functionalities are adopted by up to 90% organizations. In less than 4 years since the Affordable Care Act was upheld in the Supreme court, rapid adoption of Patient Engagement has happened. If your engagement software does not have these functionalities you are behind. Recently a new demand in the market has emerged with more and more providers being incentivized to have chat (messaging) function for their engagement software. In 2015 this was reported to be adopted by 63% of hospitals. 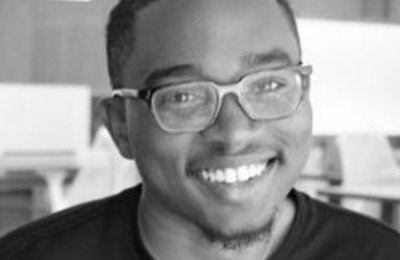 What about the functions that are not incentivized? Despite not being an incentive by federal policy more hospitals are adopting software that can update medical records, pay for medical bills, or scheduling appointments. In 2015 the highest capability adopted was the ability to update medical records. The US hospitals who had this capacity grew from 31% in 2012 to 77% in 2015. The function that has been adopted the least is the capacity for patients to submit data that they generated. A few weeks ago we went over one form of patient generating data and we looked at if wearables were helping with patient engagement. It’s no surprise that in 2015 only 37% had the capacity to receive patient-generated data. Each hospital and health organization have different departments that all have different needs for patient engagement software. The way I see it is if electronic health record act as a database for providers then patient engagement software acts as the graphical user interface for care teams and patients to use. 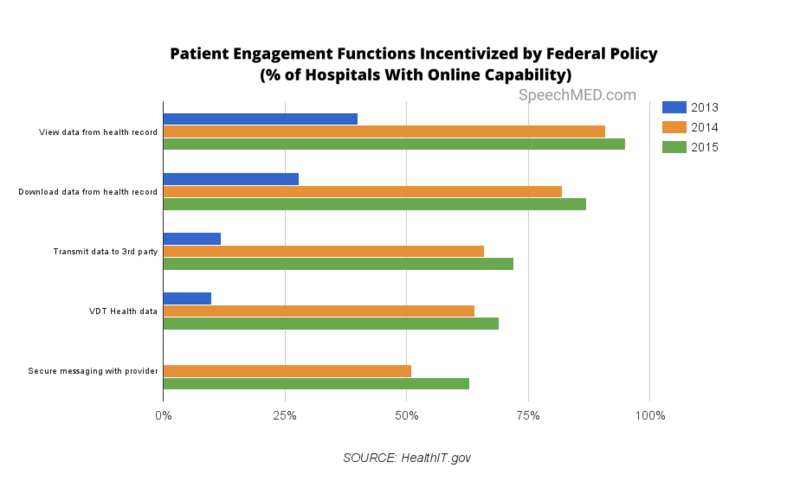 Previous Post Who is Adopting Patient Engagement Software?